It's January 1st, and all over the world, there are thousands of people taking advantage of yoga studio new-member deals in a quest to become stronger, more flexible, and hopefully, more calm and centered. These days, most everyone is aware of the countless benefits of yoga breathwork and stretching exercises, and even doctors are starting to recommend yoga to their patients. However, many of the people I speak to feel intimidated by the idea of going to a yoga class full of young and fit folks, and many of the classes offered at popular studios are not accessible for a large demographic of people. So, how is someone who may not be in "yoga shape" because of age, inactivity, or other factors, supposed to even begin a yoga practice, and how do they make sure that they're actually receiving the benefits promised by all the medical studies and sales pitches? The first thing they can do is to learn a little bit about what constitutes a therapeutic yoga practice. Most of the studies that have been conducted to research the positive benefits of yoga have focused on yogic breathwork, simple stretches and movement, and basic mindfulness. The studies show that a really simple yoga practice really works — as long as it includes three key elements of therapeutic yoga: accessible postures, breathwork and mindfulness. The problem that a new practitioner faces when they start going to studio classes, is that most teachers don't cover the basics of yogic breathing, and the posture practice is often focused on challenging or pushing the students to their limits (and often beyond) — instead of meeting them where they're at. Not to mention that very few classes even include meditation and are often so fast-paced and music-driven that it's nearly impossible to pay attention to the subtleties of what's happening with your breath or in your body. So, where to begin? If you're interested in vinyasa classes — which is a popular style that integrates breathwork and movement (and the style I teach) — it helps if you understand the basic principles of 1) how to breathe and 2) how to link your movement to your breath. In most of the vinyasa classes I've been to, the teacher may tell you to focus on your breath, or mention ujjayi breathing, but they often never offer the basic instruction on how to do it. I remember the first time I was in a class where the teacher focused on the basic principles of vinyasa (thank you Joanna!) and how everything immediately clicked for me — I finally got what they were talking about all this time! Yoga! Yes! I began to feel for myself the benefits of this way of practicing, and so now when I teach, I always go over the fundamentals — even with people who have been practicing for a long time, because I know that I went to classes for years without receiving the basic instructions that help make your practice safe, effective and most importantly, enjoyable! Once you understand the fundamentals of how to practice, it can be a good idea to start practicing at home to "get in shape" and become familiar with the basic postures that you'll probably encounter in most yoga classes. You can do this by practicing with videos geared toward beginners, consulting a teacher privately, or taking on a beginner-friendly home yoga challenge. If you've made a resolution to "start yoga" or "do more yoga", congratulations! A regular yoga practice can go a long way toward helping you feel more calm, strong and connected, which incidentally, is the name of the free 30-day yoga challenge I'm facilitating this month (wink, wink). If you want to join over 100 people from around the world, ages 20-68(!) go over to calmstrongconnected.com to sign-up. If you missed out on this challenge, sign up to my newsletter to be notified of the next one, or contact me about private consultation via Skype. 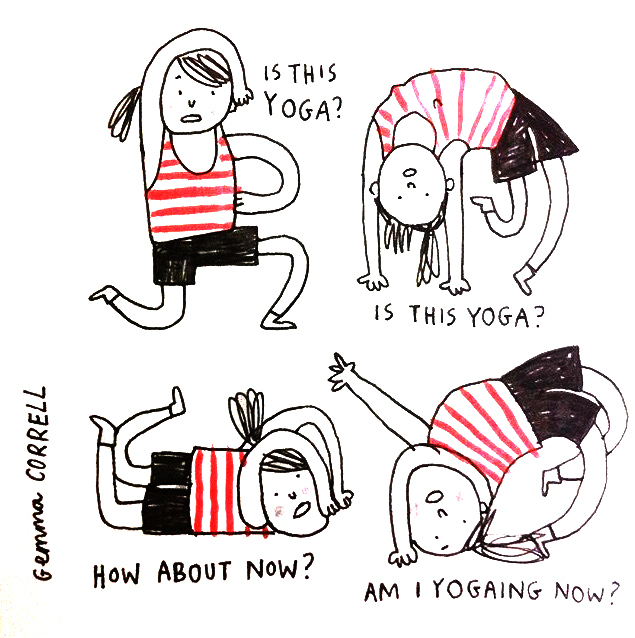 Interested in starting a yoga practice? I can help!